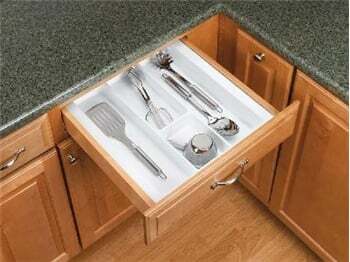 Organize your utensils in your kitchen drawer with a Rev-A-Shelf Utility Tray. Available in four styles and four sizes, these can easily be trimmed for the perfect fit in any drawer. Measure, trim, and drop-in for a quick and easy organization project that eliminates the clutter in your drawer. Organize the utensils in your kitchen drawer with a Rev-A-Shelf Utility Tray. Measure, trim, and drop-in for a quick and easy organization project that eliminates the clutter in your drawer. Pull open the drawer and easily find the gadget you need. 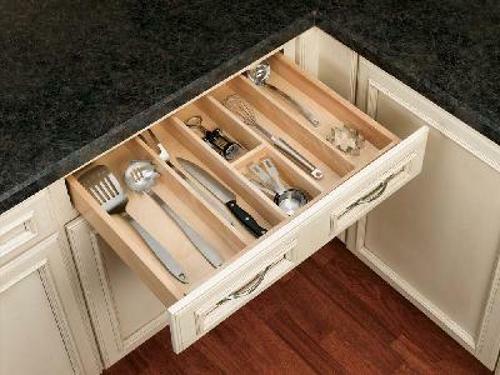 Organizes spatulas, ladles, serving spoons, other cooking items. 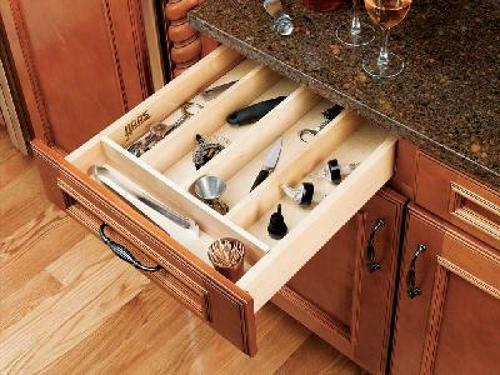 The utility drawer organizer can also be used to store those tools you need for quick repairs. No need to dig through a bulky tool box. Have the items you need readily available and neatly stored away, all within easy access. Ships with a removable clear protective coating to protect the finish. Available in four styles and four sizes, these trays can easily be trimmed for the perfect fit in almost any drawer. Wood Utility Tray - Cut to size, drop-in installation, 18-1/2" (470 mm) trimmable to 8-1/8" (207 mm) Wide x 22" (560 mm) trimmable to 17" (432 mm)deep x 2-7/8" High. Wood Utility Tray - Cut to size, drop-in installation, 18-1/2" (470 mm) trimmable to 8-1/8" (207 mm) Wide x 22" (560 mm) trimmable to 17" (432 mm)deep x 2-3/8" High. Our collection of trays will fit virtually any kitchen drawer and organizational need. All trays are trimmable to fit inside your drawers dimensions. They are made of heavy guage polystyrene and are top-rack dishwasher safe.